The summer is in full swing, which means it’s wedding season. The warm weather and sunny days make this the best season for tying the knot – as long as a storm doesn’t hit of course – but it also comes with its own challenges. 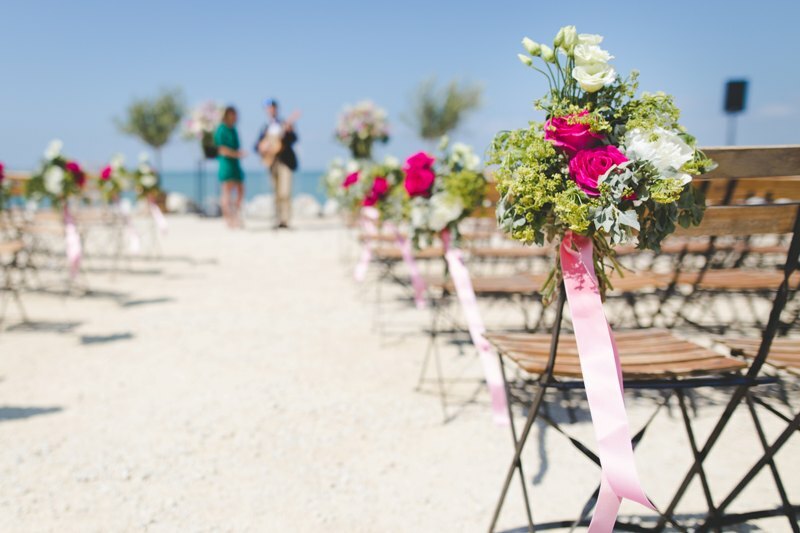 Outdoor weddings are popular for all the right reasons, but in the blazing summer heat, plans can go wrong if they’re not considered beforehand. That’s why we’ve compiled a list of the top tips for having the best summer wedding. Heat, humidity, and sun can roast your bridesmaids in their dresses! If you’re planning an outdoor summer wedding, make sure you pick out the right fabrics for your outfit. Go with breezy and lightweight material. You may also want to skip the long train unless you want to carry the dirt around of course. Provide skin and bug protection to your guests unless you want them to complain about sunburn instead of talk about the great wedding. Heavy, rich food is great, but it may not be the most appropriate choice for a summer event. Pack your menu with refreshing options – fruits, cold desserts, and grilled meats – rather than heavy fare. Staying hydrated is the most important part of being outside in the summer, and that doesn’t change because of a wedding! Make sure there are plenty of water supplies available, preferably with ice! What better way to embrace the summer than with fresh, frozen cocktails? Colorful and cold beverage options can help enhance the summer feel, as well as keep your guests cooled down as they drink. Depending on where you live, and where you want to get married, you may want to consider natural shade, renting fans, or possibly a mixed indoor/outdoor space altogether. If your venue sets out metal chairs, prepare in advance some fabric covers so guests don’t burn themselves sitting down! Not only is there going to be plenty of competition for wedding guests this summer, there’s the usual fight for vacations as well! Since summer is the season families go on their cruises or flights, you want to make sure they know about your wedding as far in advance as possible. This gives them time to adjust their schedules and means you won’t end up with an empty guest list because they’re all in the Caribbean. For both practicality and aesthetic, aim for lighter, brighter palettes for your wedding. White and pastels are always good options, both for appearance and to keep the heat away. Food sitting in the sun can only lead to stomach bugs, and that’s definitely not the impression you want to leave with your guests. Cover your platters and keep them cool until dinner. The cake should be refrigerated until it’s time to cut, when it can be wheeled out. Instead of brochures, consider parasols or fans for a creative, and useful, touch to your wedding.